 Is there such a thing as a universal code of ethics? A senior columnist for the Christian Science Monitor interviews 24 remarkable people from different cultures, beliefs, and walks of life and comes up with a short list of values that cross cultural boundaries. A shrinking world and technological progress, argues Kidder, mean that problems are increasingly global and demand solutions that presuppose a framework of values acceptable everywhere. 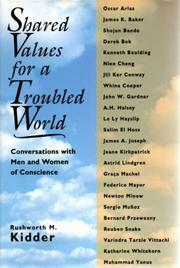 Kidder (Re-Inventing the Future--not reviewed) challenges the fashionable belief that there are no universal values. He offers us the views of a diverse range of men and women who are involved in the fields of religion, education, business, literature, and politics, and who are regarded by their peers as ethical standard-bearers. We meet Federico Mayer, director general of UNESCO; Reuben Snake, a Native American tribal chief; Nien Cheng, the bestselling Chinese author; Graca Machel, Mozambique's former first lady; a Catholic priest; a Bangladeshi banker; a Buddhist monk in Japan; a Maori activist in New Zealand; and many more. Feminist historian Jill Ker Conway sees the rise of fundamentalism as filling a vacuum left by a secular education and the consequent erosion of moral value, and she looks forward to a revival of internationalism rooted in environmental awareness. Former president of Costa Rica Oscar Arias argues that demands for individual rights are less valid than a sense of responsibility derived from our inescapable interdependence with the ecosystem. In a concluding chapter Kidder picks out eight values that emerge from all the interviews including love, truthfulness, fairness, freedom, community, and tolerance. Since his approach is avowedly pragmatic, Kidder does not address philosophical problems, yet he is careful to nuance his position and to avoid the temptation of trying to prove too much. A popular but intelligent approach to a continuing concern.